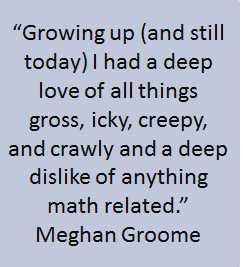 Today’s profile is an interview with Meghan Groome, PhD, New York Academy of Sciences Director of K12 Education and Science & The City, who answered our questions via email with DXS Biology Editor Jeanne Garbarino. MG: I was a bio major since age two. 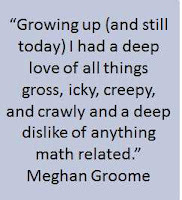 Growing up (and still today) I had a deep love of all things gross, icky, creepy, and crawly and a deep dislike of anything math related. 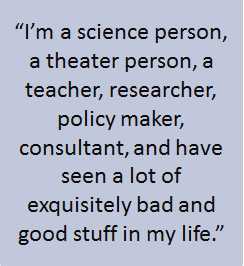 My parents didn’t really know what to do with me, so a theme to my scientific background is that although I was a straight-A student in my bio classes, no one had any idea that I should be doing enrichment programs or making an effort to learn math. I figured that by being a great bio major, I would become a great scientist. So I was an excellent consumer of scientific knowledge but only realized late in life that I needed to be a producer to actually become a scientist. Being a straight-A student doesn’t actually get you a job when you graduate from a small liberal arts college with a degree in biology and theater, and out of desperation, I took a job teaching. 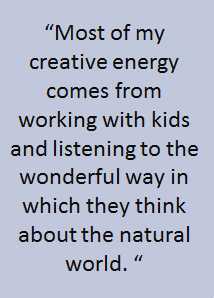 While I wasn’t a good scientist, I turned out to be an excellent teacher and loved the creativity, energy, and never-ending questions that go along with being a science teacher. If you teach from the perspective that science is an endless quest for knowledge, you’ll never get bored taking kids on that journey. While my background is in biology, my graduate degree is in science education, and I study gender dynamics and student questioning the middle-school classrooms. I currently work for the New York Academy of Sciences as the Director of K12 Education and public programs and spend most of my day convincing scientists that education outreach is not only part of their jobs but a lot of fun. MG: I’m also a photographer and spend a lot of time wandering around neighborhoods in Brooklyn with a special love of decaying buildings and empty lots. I love how nature conquers things that we humans consider to be permanent - like how we have to constantly beat back the invading hordes of plants and animals even in one of the most man-made environments in the world. I was also a theater major, so (I) have a strong background in costume design and stage directing. I hate acting but love dance. If I had any talent I would have become a musical theater star but unfortunately enthusiasm and determination can only get you so far. 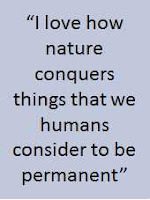 MG: I find great joy in seeing how nature conquers human engineering. When I learned about Lynn Margulis’ Gaia hypothesis, I began seeing it everywhere and I think I love photography because I’m documenting the Earth fighting back. MG: People tell me all the time “You’re not what we expected” and I’m not really sure how to respond. In the science education world, my research is informed by my experiences teaching in a very poor district and from a social justice perspective. It’s a rather controversial theoretical framework because it says, “I have an agenda to use my research to bring about equity in an unequal world.” From a research perspective, it means you need to be explicit in your point of view and your biases and have much greater validity and reliability to show that your research is solid. My work is very passion driven so I’ve had to learn when it’s appropriate to pull out my soap box and go full-out social justice to them. This is changing, but for a long time I kept my personality under wraps in a professional setting. It’s only now -- with 10 years professional experience, great organizations on my resume, and a PhD -- that I can be clever, confront those I disagree with, and even smile. Anyone who’s ever had a beer with me knows that I’m a goofball and will do just about anything to make someone laugh. 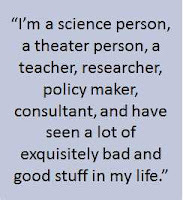 I’m a science person, a theater person, a teacher, researcher, policy maker, consultant, and have seen a lot of exquisitely bad and good stuff in my life and so I am frequently the voice of an outsider even though I look and sound like a total insider. That can really freak people out especially if they’ve only read my bio or seen me in my most professional mode. MG: I approach teaching science from a fairly theatrical perspective. In my class we dance, sing, laugh, talk about the real world. I’ve never used the textbook, and I’m very insistent that everything be in the first person when writing or speaking about science. I much prefer teaching regular classes -- not honors or AP -- and can’t stand kids who remind me of myself in high school. I approach scientists in the same way and try to make them comfortable admitting that their more than a brain on a stick. 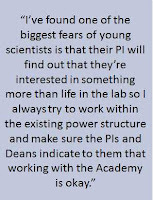 I’ve found one of the biggest fears of young scientists is that their PI will find out that they’re interested in something more than life in the lab so I always try to work within the existing power structure and make sure the PIs and Deans indicate to them that working with the (New York) Academy (of Sciences) is okay. DXS: How comfortable are you expressing your femininity and in what ways? How does this expression influence people's perception of you in, say, a scientifically oriented context? MG: This question confounds the heck out of me. I am still such a tomboy and have always chosen to present myself as a somewhat genderless individual. I’ve always considered myself “smart not pretty” because I can control how smart I am but not how pretty. A few years ago, my sisters pulled me aside and told me I needed to stop dressing like such a slob. They started buying me pretty, fashionable clothes and insisting that I wear skirts above the knee and get a real hair cut. Since I started working at the Academy, I have a very public facing role and have grown to accept that I should look nice. 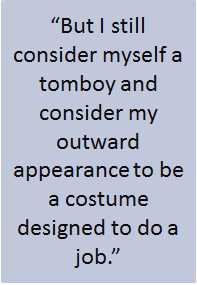 This goes along with slowly feeling comfortable letting my personality out in professional settings but I still consider myself a tomboy and consider my outward appearance to be a costume designed to do a job. So I guess the answer is, femininity, what femininity? DXS: Do you think that the combination of your non-science creativity and scientific-related activity shifts people's perspectives or ideas about what a scientist or science communicator is? If you're aware of such an influence, in what way, if any, do you use it to (for example) reach a different corner of your audience or present science in a different sort of way? MG: I think very few people are brains on a stick but that being a scientist often requires us to pretend we have no life outside the lab. 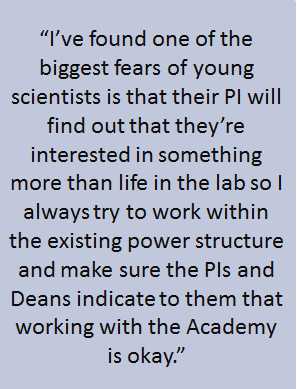 I’ve now worked with hundreds of young scientists who spend time working with kids and I’m so pleased to see how quickly they shift from lab geek to real person when talking with a 4th grader. I want scientists to be evangelicals for science, and I want that to include the fact that scientists are real, fallible, wacky, wonderful people too. MG: I was always encouraged to be an individual and be myself. I credit my parents with allowing me to pursue my passion and not try to box me in to one identity. It’s never been easy to forge my own path, and I dedicate a lot of myself to my work. My advice to my younger self would be to slow down a bit, know that you don’t have to get 100% on everything, and know that the problems of the world don’t have to be solved right now. And perhaps to learn how to be a bit more like a girl. 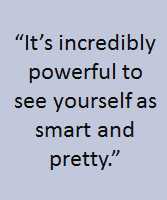 It’s incredibly powerful to see yourself as smart and pretty. Meghan Groome is the Director of K12 Education and Science & the City at the New York Academy of Sciences, an organization with the mission to advance scientific research and knowledge, support scientific literacy, and promote the resolution of society’s global challenges through science-based solutions. After graduating from Colorado College in Biology and Theatre, she desperately needed a job and took one as a substitute teacher at a middle school in Ridgewood, NJ. She discovered that she had a knack for making science interesting and enjoyable, mostly through bringing in gross things, lighting things on fire (but always in a safe manner), and having a large library of the world's best science writing and science fiction. After teaching in both Ridgewood and Paterson, NJ, she completed her PhD at Teachers College (TC) Columbia University with a focus on student question-asking in the classroom. While at TC, she was a founding member of an international education consulting firm and worked on projects from Kenya to Jordan with a focus on designing new schools and school systems in the developing world. After graduating, Dr. Groome became a Senior Policy Analyst at the National Governors Association on Governor Janet Napolitano’s Innovation America Initiative. Prior to her work at the Academy, Dr. Groome worked at the American Museum of Natural History and authored the policy roadmap for the Empire State STEM Education Network and taught urban biodiversity in the Education Department. At the Academy, she is responsible for the Afterschool STEM Mentoring program, which places graduate students and postdocs in the City’s afterschool programs, and the Science Teacher program, where she designs field trips and content talks to the City’s STEM teachers. Connect with her on Twitter, and read her NYAS blog!